The Hawkeye 201 filter system uses an air pump and air stone in an upright plastic tube to create a suction action that pulls particulate matter into the gravel and the slotted plastic base. Air filters are one of the most common and affordable filtration options; while many air filtration systems use a carbon head to filter out chemicals, the Hawkeye 201 only uses the suction action; regular water changes as well as cleaning the gravel are a must for a healthy tank. Setting up the Hawkeye filter does not require any tools or equipment. Connect the clear plastic tube to the slotted base. Place the slotted base with connected plastic tube in the bottom of the aquarium. Connect an aquarium air hose to the air pump. Connect an air stone to the other side of the tube, and run the stone down to the bottom of the tube. Fill your aquarium with 1-1/2 inches of gravel and add water until the aquarium is full; the water should be over the top of the tube. Plug in your air filter, and the Hawkeye 201 is ready. 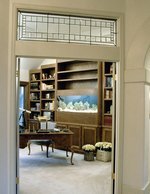 Let the aquarium sit for 24 hours before adding any fish. 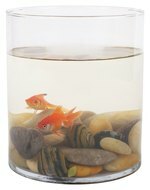 Remove the fish from the aquarium, and put them in containers filled with the same aquarium water. For a simple water change, just remove a tenth of the water, and replace it with fresh dechlorinated water. Consider using a gravel siphon to clean out the particulate matter so you don't have to transfer your fish. Remove and clean the air hose and air stone. If your air stone is falling apart, you can buy a replacement at most pet stores. Pour the aquarium into a collander, gravel and all, and remove the air filter base and tube. Clean the gravel, the base and the tube with hot water. Set the tank up again, let it sit for a few hours, and re-acclimate your fish by putting their container into the aquarium, until the water temperatures match, and then release them.